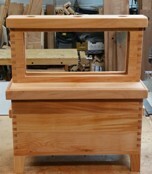 GSLWW Ulster style observation hive for sale in solid red alder. Five-frame deep nuc box with single deep frame observation box. Removable queen excluder separates boxes so queen will remain in demo box while workers can come and go. Fully screened bottom on nuc box with screened ventilation holes in lid – flight tube hole on nuc box pre-drilled if desired. Dovetail joinery, antiqued safety latch hardware and non-breakable acrylic windows . Everything disassembles easily for cleaning. Sturdy solid wood handles on box provide ease of carry. Renewable oil and wax finish on all exterior surfaces (no stripping necessary). Hand built – a showpiece that will last for decades – great for a school, fair, club or for someone that wants a real conversation piece. Improved Ulster-style observation hive for sale. *Please note: Honey Bee Suite has no financial interest in GSLong Woodworking or the sale of this hive. Those observations hives are beautiful Rusty! I just got one from Brushy Mountain, which is fine, but not a piece of art like these. I will make inquiries, thanks for posting that. I am very interested in purchasing the hive. Do you know a ballpark amount for shipping to Georgia? When I transport this hive to schools etc. so some bees get left behind? How does that work? The builder’s contact information is in the post. This hive is beautiful. I would be happy to purchase it. Please tell me how.